There are, actually, quite a lot of people like myself who enjoy photographing trains. There aren’t as many, however, who know what they’re doing. 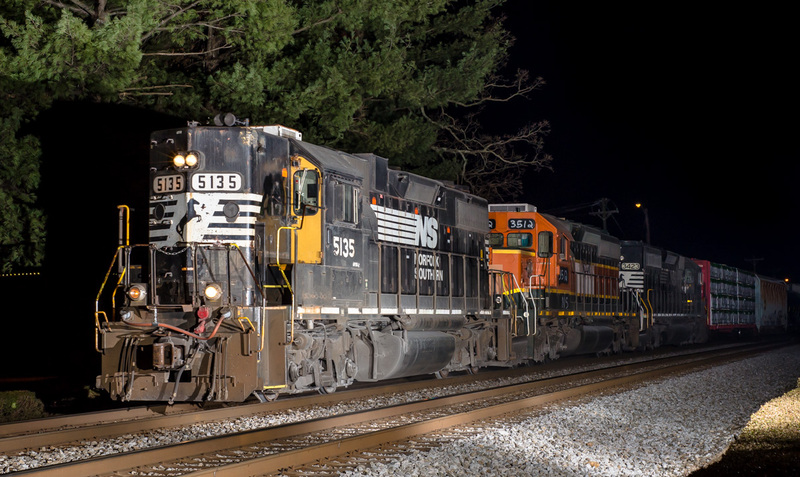 Then, there’s a rather exclusive group of people who use strobes to light trains at night. Popularized by a man by the name of O. Winston Link, using flash to light a moving train can be an interesting challenge. With a static subject, you can get a pretty good idea at what your lights are doing. In this case, however, you have to sort of guess and hope for the best. I won’t even go into the difficulty of framing a subject that isn’t there yet! I failed to be successful with seven trains between two nights, but just before 11 pm on last Sunday night, train P84 rolled through and I nailed it!